A man found a tiny stray kitten while he was walking his dog. The little fearless kitty was determined to follow them home. Last summer when Jon Nienaber was walking along the neighborhood with his dog, a tiny stray kitten ran up to them and decided to tag along. "My husband and I live in Cleveland, OH, in an area with a lot of feral cats. 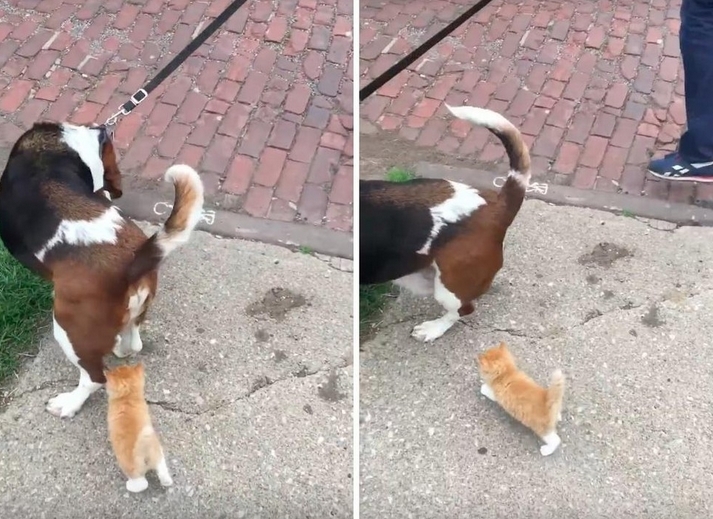 We have a basset hound, and one day my husband was walking the dog when he called me and told me he found this adorable little kitten that just seemed like he wanted attention," Leslie Nienaber told Love Meow. She quickly grabbed some cat food and headed over to meet the kitten. Little Pinot was so tiny at the time that he could fit into the palm of their hand. "He poked his head through a little chain link fence, and he started following Jon and I as we were walking away! He seemed determined to stay with us." The brave little ginger boy tried to play with his canine friend and would walk up to people for love and attention. "When I got him home, he was really dirty, and I tried to clean him the best I could. He seemed hungry," Leslie told Love Meow. The couple already had three cats and a dog, a full house, so Leslie thought about her sister, Sarah, who is also a cat lover herself. Sarah came the next day and took the kitten in with open arms. 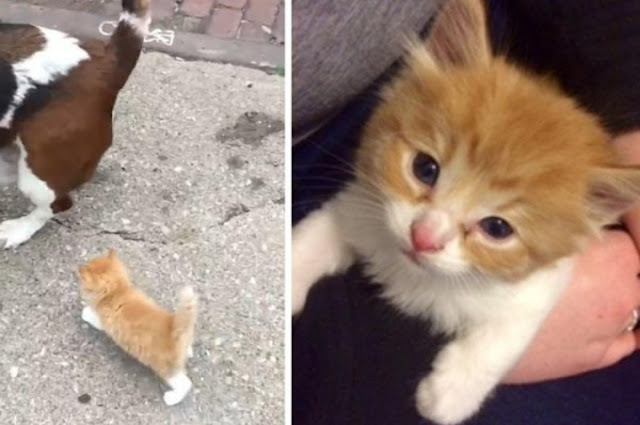 Responses to "Tiny stray cat sprints up to man and dog and determined to follow them home"
Bless the people who care for the little animals. You don't choose your animal, the animal chooses you. Isn't that wonderful?